A majority of the reviewers felt comfortable while wearing the Hoka Bondi 5. The wide toe box should be a welcome change, particularly for those who have slightly wider feet. The extra widths available should be even better good news for those who require more room up front. Some runners noticed how light the shoe is despite the oversized cushioning. A handful of reviewers really liked the lightweight and breathable upper. Some of those who have had foot, back, or hip problems felt better when running in the Hoka One One Bondi 5. The traction is quite good for a road shoe that it can do adequately well on light trails, according to a few. A small number of runners mentioned their stable rides in this shoe. Several of those who are up on their feet most of the time during work valued the shoe’s cushioning. Outsole durability gets a boost with the addition of more rubber. Some loyal fans of the Bondi did not like the stiffer midsole, which took away their pleasure during long distance runs. A good number of Hoka fans bemoaned that it still lacks the room in the toe box despite the added space in the latest version of the Bondi. A handful of runners observed that the meta-rocker technology felt dead in this shoe and removed the smooth transition through the gait cycle. The price of the Bondi 5 is quite expensive. A few runners had problems with the tongue as it caused rubbing or irritation. Hoka markets the Bondi 5 as its most cushioned runner, which is quite a feat in itself as the Hoka brand is known for its oversized cushioning. The latest version of this ultra-cushioned trainer has decent arch support, more room in the forefoot, excellent ventilation, and the added benefits of an extra wide option. While some loyal fans of the Bondi are hotly divided regarding the shoe’s performance, Hoka offered upgrades that have been generally well-accepted and welcomed by runners. The Hoka One One Bondi 5 is the closest that you can get to running on clouds, in terms of the soft ride...and the distance off the ground. The Bondi 5 is the most cushioned shoe on the market. Running in an excessively cushioned shoe used to mean that you would be running in a heavy and unstable shoe. Hoka eliminated these problems with the Bondi 5. The Bondi 5 allows runners to comfortably let their shoes absorb all of the impact of running, instead of abusing their legs. The Bondi 5 has soft and comfortable double layer mesh upper, which is reinforced with overlays around the perimeter of the shoe. The Bondi 5 is a semi-breathable shoe. Hoka tried to make this shoe breathable by perforating the upper in the toebox area, however, my feet felt a little bit stuffy on hot summer days. The advantage of the thicker upper is that the shoe is more durable. The Bondi 5’s upper did not give me any blisters. The mesh used is not stretchy, however, the shoe has a high volume toe box, which eliminated rubbing. The heel collar and tongue are both plushly cushioned. The Bondi 5 has a very high volume fit through the midfoot and toebox. I have to tie my laces very tightly to get a secure fit. Even when the laces are tied very tightly, the tongue prevents any pressure points forming on the top of my feet. The Bondi 5 has a small plastic heel cup. The heel cup is angled forward towards the forefoot, which keeps your heel pressed up against the shoe at all times. This helps make the fit more secure. The Bondi 5 uses a technology called side walls. Essentially, the midsole comes up around the sides of the foot. The side walls cause your foot to to stay put in the shoe. They also greatly increase the stability of the ride. The Bondi 5 has a straight fit, with just enough room in the toebox so that my big toe is pointed straight forward and my toes are not squished together. Having a straight big toe is very important for power and stability during the landing and push off stages of the gait cycle. The midsole is where the Bondi 5 really stands out. Underneath the sockliner, is a strobel board, and a giant slab of soft EVA foam. A strobel board is a hard piece of plastic underneath the sockliner that prevents your foot from sinking into the midsole. This usually makes the shoe feel less cushioned and faster. A strobel board usually causes you to activate your foot and lower leg muscles because it makes you land on a harder surface, despite the shoe absorbing the same amount of shock. The shoe’s excessive cushioning makes the Bondi 5 feel like it doesn’t even have a strobel board. Your foot feels like it sinks into the midsole whilst running. This just goes to show how much cushion this shoe really has. There is so much cushioning that your legs will still feel fresh after a long run. A common concern with maximalist cushioned shoes is the stability. Many people felt like they were going to roll their ankle while running in previous models of the Bondi. Hoka has made the Bondi 5 wider than previous models. The wider design contributes to the shoes stable ride. The Bondi 5 has a 4 millimeter drop. Usually a 4 millimeter drop is only comfortable for forefoot strikers because low drop designs slows down heel to toe transitions. Hoka uses its Meta Rocker technology, which is essentially a rounded heel and forefoot to allow heel strikers and forefoot strikers to quickly roll through the ground contact phase of their gait cycle. This makes the shoe comfortable for anyone with any type of foot strike. The Bondi 5 is very stiff. This is unavoidable with such a thick midsole, however, it is not uncomfortable because the meta rocker design makes flexing the shoe completely unnecessary. Another major concern that many people have with max cushioned shoes is that they will feel very sow. The Bondi feels slower than other max cushioned running shoes such as the Hoka Clifton, however, the Bondi does not feel slow by any means. The stiff midsole, the Meta Rocker technology and the strobel board make the shoe even faster than a regular daily trainer. The Bondi 5’s outsole is made of patches of hard EVA, and two different rubber compounds. The forefoot has sticky rubber pads that provide great traction on wet pavement and dirt roads. 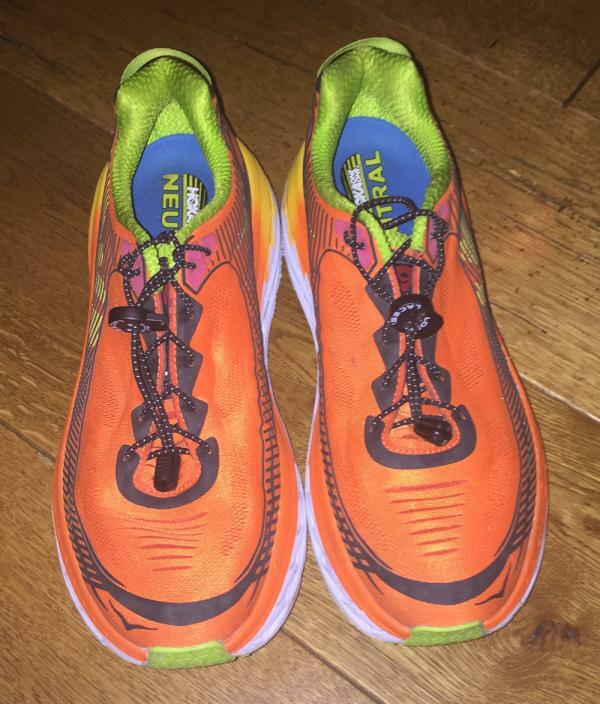 Heel strikers tend to abuse the heel of the shoe, which is why Hoka placed more durable rubber in the heel. The midfoot has a CMEVA outsole, becuase traction and durability are not needed there. There many small grooves in the outsole. These grooves pick up small stones. Since the midsole is so stiff, the grooves do not widen during push off, and the stones stay put until you stop and pick them out. I ordered this shoe because I started to develop a stress fracture in my little toe. I used the Bondi 5’s as my daily trainers and never felt my toe injury again. I recommend this shoe to any neutral road runner who wants a highly cushioned shoe. The Bondi 5 gives you the capability to run on very sore legs and to run while nursing minor injuries. I also recommend this shoe to anyone who wants to significantly increase their training volume. The Asics Gel-Nimbus 19 is a normal looking shoe, with maximum cushioning. The forefoot cushioning in the Nimbus doesn’t even come close to the forefoot cushioning in the Bondi, but the heel cushioning in the Nimbus is quite substantial. The Nimbus has much more dense cushioning than the Bondi. The Nimbus has a 10 millimeter drop, which makes it more of a heel striker shoe. The Nimbus is about an ounce heavier than the Bondi. The Nimbus is also less responsive. The Stinson is the shoe that most closely resembles the Bondi. The Stinson weighs about an ounce more than the Bondi. The Bondi has softer cushioning than the Stinson, however, the Stinson is more responsive than the Bondi. The Bondi has a more comfortable upper than the Stinson. The Stinson has a 6 millimeter drop, compared to the 4 millimeters in the Bondi. The Adidas Ultra Boost is the ‘fashionable’ max cushioned road running shoe. The heel has substantial cushioning, however the forefoot has little cushioning due to the 10 millimeter drop. The knit upper is more comfortable on the Ultra Boost. The Ultra Boost is also more durable than the Bondi. The Ultra Boost is more responsive than the Bondi due to the Boost midsole material. The Bondi has more cushioning and is lighter than the Ultra Boost. The Bondi is far more cushioned than the Triumph. The Triumph is heavier and more durable than the Bondi. The Triumph has a more responsive midsole foam than the Bondi. The Triumph has an 8 millimeter drop, compared to the 4 millimeters in the Bondi. The Triumph has better traction than the Bondi. The Triumph is also much more flexible. Buy ½ size down in the Triumph. These two shoes are very similar. The Paradigm has almost as much cushion as the Bondi. Both shoes weigh the same amount and provide similar amounts of traction. The Paradigm is a zero drop shoe, which makes it best for forefoot strikers. The Paradigm has a very wide fit in the toebox. The Bondi is stiffer than the Paradigm. Both shoes are equally responsive and durable. Buy ½ size down in the Paradigm. Overall, the Bondi 5 is a great maximum cushioned shoe. I took off points because on very hot days my feet were uncomfortable, and because the outsole picked up so many little stones. Hoka has finally made a max cushioned beast that is both lightweight and stable. If you're looking for a shoe that will treat your feet and legs to the most highly cushioned ride possible, without sacrificing too much speed, then you need a pair of Bondi 5s. I like it. It is a nice, smooth ride. I really appreciate what Hoka's doing. Keep up the great work. They kinda added these flex grooves through the middle here, which [sic] a lot of rocks are getting stuck in those. If you want to experience the Hoka One One maximum running shoe, you need to try the Hoka One One Bondi 5. The Bondi 5 features an updated upper that provides breathability. The Comfort Frame hugs the foot with maximum comfort with a sock-like feel while the padded tongue delivers added comfort while enhancing the fit. The midsole of the shoe was also modified to deliver enhanced underfoot protection and durability for neutral pronators. It offers a more responsive ride while running on the road. The outsole was also updated. The shoe features an updated lug pattern and new rubber material to improve traction and durability. The Hoka One One Bondi 5 comes with an enhanced fit. It offers a snug fit from the heel to the forefoot area and is available in standard running shoe length. It is available in medium and wide widths in sizes 7 to 15 for the men’s version and medium width with 5 to 11 sizes for women’s. The outsole unit of the shoe has an updated lug pattern that delivers enhanced traction while running on the road. The shoe also features the Zonal Rubber Placement that is designed for improved durability. The Hoka One One Bondi 5 also utilizes the moderate Heel Bevel that is specifically designed not only for a smoother heel to toe transition but also for added durability and enhanced ground contact. The midsole of the Bondi 5 features the improved full-length EVA cushioning that gives a durable and responsive cushioning for a more satisfying running experience. Aside from the technical updates, the midsole unit also has an updated design for a fresh look. The same material is utilized in the Bondi's sixth iteration. The Hoka One One Bondi 5 comes with a breathable upper coverage that keeps the foot dry and comfortable all throughout the run. The Comfort Frame delivers maximum comfort and the 3D Puff Print Frame offers a lightweight and added support.